Flyer "CoVaForm - Conservation of valuable materials by a highly efficient forming system"
The aim of the project was a reduction of valuable materials (such as bainitic grade steel or titanium) and energy consumption for SMEs in the European forging industry. A higher material utilization could be achieved by the use of cross wedge rolling (CWR), which is a flashless forming operation. Using CWR the material utilization was significantly improved for two model products (hip implant and heavy duty common rail) made of titanium and stainless steel. To reduce production costs of forged parts, different approaches are possible. Especially for valuable materials like titanium, material costs represent a large part of the production costs. Therefore, reducing the initial material can decrease the total costs significantly. In order to identify the potential for improvements, an existing forging sequence was investigated. For a titanium hip implant, a new forging sequence was developed. To reduce the initially needed material, cross wedge rolling as a preforming operation and die forging with flash brakes was investigated. The influence of the different stages on the final result was analysed and presented in detail. To increase the prediction accuracy of the newly developed flash-reduced forging sequence and to decrease iteration loops of die designs, feasible simulation parameters considering the boundary conditions of the forging environment were investigated. This is done using Finite Element Analysis (FEA), considering form filling, process stability, die stress and press forces. Using cross wedge rolling and die forging with flash brakes, the newly developed forging sequence reduces the flash rate significantly from 69 % to 32 %. Stonis, M.; Blohm, T.; Behrens, B.-A. ; Güzey, G.; Eratz, H.: Kostengünstige Querkeilwalzmaschine für Kleinserien. In: Massivumformung, Industrie MassivUMFORMUNG e. V. Verlag, Hagen, o. Jg. (2016), H. 2, S. 62-66. In order to enable small and medium-sized enterprises to use cross-wedge rolling in the future, existing barriers have been eliminated. For this purpose, a method was developed to enable the design of cross wedge tools using software support. For two demonstrator components, hip implant and common rail, cross-wedge rolling processes were designed. With the cross-wedge rolled preforms, flash-reduced forging sequences could be designed for both demonstrator components. In order to be able to roll the parts industrially at low cost, a cross wedge rolliing machine was designed, manufactured and built at the forging company. The complete process chain of the hip implant was successfully tested. Blohm, T.; Reichert, S.: IPH entwickelt neuen Schmiedeprozess: Querkeilwalzen spart 20% Stahl bei der Produktion von Common-Rails. In: Stahl und Eisen, Verlag Stahleisen GmbH, Jg. 136 (2016), H. 7, S. 52-53. In the future, common-rails can be produced with significantly less material - thanks to a new forging process, which was developed by the IPH in cooperation with partners from all over Europe. Using cross wedge rolling (CWR) as a preforming step with a following final forging step the part can be produced with significantly less flash than before. Especially for the demands of small and medium sized enterprises (SMEs), IPH designed a very compact CWR machine for flat-dies that pays off even for small batches. It is the first machine of its kind which will be used under industrial conditions: A Turkish forging company wants to manufacture preforms for hip implants. Blohm, T.; Stonis, M.; Behrens, B.-A. : Investigation of Simulation Parameters for Cross Wedge Rolling Titanium and Bainitic Grade Steel. In: Applied Mechanics and Materials, Trans Tech Publications, Switzerland, vol. 736 (2015) pp. 165-170. In this paper the comparison of simulations of cross wedge rolling processes with real trials using flat cross wedge tools is presented. The investigated materials are titanium and bainitic grade steel. First simulations were used to find the suitable parameter combinations for the investigated materials. Afterwards tools were manufactured with these parameters and additionally with some variations to investigate a field of parameters around this range of parameter values. The purpose of these tests is to find geometrical and process parameters with which a stable cross wedge rolling process for bainitic grade steel and titanium is possible. Blohm, T.; Knust, J.; Stonis, M.; Behrens, B.-A. : Querkeilwalzen optimieren. In: Konstruktion, Springer VDI-Verlag, 66. Jg. (2014); H. 10, S. IW12 - IW14. The production of titanium parts in small batches using a flexible machine and a fast layout method as well as a temperature and defect measurement were not considered in investigations yet. However the industry using valuable materials showed interest in this technology and the CWR module in order to realize the advantages of the CWR technology for small and medium batch sizes. 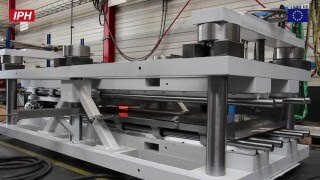 Therefore a CWR machine for flat wedge tools will be developed in the EU project CoVaForm. The wedge tools used in this project will be designed for rolling titanium and micro-alloyed steel. To help SMEs a software tool will be developed for designing CWR processes. Especially for rolling valuable materials like titanium, the boundary conditions are mostly unknown; therefore pre-tests will be done to get process parameters which will enable a working CWR process. To ensure a defect-free production, a quality control will be developed based on thermography which detects defective parts directly during the rolling operation. Blohm, T.; Stonis, M.; Behrens, B.-A. : Flat cross-wedge rolling for preforming reduced-flash forgings. In: FORGING magazine, Penton Publication, vol. 24 (2014), no. 4, pp. 16-18. The production of titanium parts in small batches using a flexible machine and a fast layout method as well as a temperature and defect measurement were not considered in investigations yet. However the industry using valuable materials showed interest in this technology and the CWR module in order to realize the advantages of the CWR technology for small and medium batch sizes. Therefore a CWR machine for flat wedge tools will be developed in the EU project CoVaForm. The wedge tools used in this project will be designed for rolling titanium and micro-alloyed steel. To help SMEs a software tool will be developed for designing CWR processes. Especially for rolling valuable materials like titanium, the boundary conditions are mostly unknown; therefore pre-tests will be done to get process parameters which will enable a working CWR process. To ensure a fault-free production, a quality control will be developed based on thermography which detects faulty parts directly during the rolling operation. This project received funding from the European Union’s Seventh Framework Programme for research, technological development and demonstration under grant agreement no. FP7-SME-2013-606171.